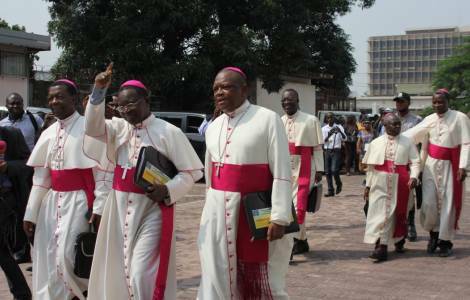 AFRICA/DR CONGO - The Bishops: "A campaign of defamation of the Church underway while the Country prepares to vote"
Kinshasa (Agenzia Fides) - "We denounce the campaign of discrediting and defamation of the Catholic Church and its hierarchy", says the National Episcopal Conference of the Congo (CENCO) in the statement published at the end of the Extraordinary Plenary Assembly held in Kinshasa from 15 to February 17th. The Bishops of the Democratic Republic of the Congo say they are "deeply concerned by the very serious facts and hostile attitudes" as the Country prepares itself for the presidential and legislative elections scheduled for December 23rd. The document, sent to Agenzia Fides, denounces the "bloody repression" of the peaceful demonstrations of December 31, 2017 and January 21, 2018, promoted by the Lay Coordination Committee (CLC), a Catholic lay organization. "Why so many deaths, injuries, arrests, kidnappings, attacks on parishes and ecclesiastical communities, humiliation, torture, intimidation, desecration of churches, prohibitions to pray?" denounce the Bishops, who recall that the protesters peacefully demanded the full application of the 'Agreements of 31 December 2016, mediated by CENCO and aimed at bringing the Country to the elections as soon as possible. "The national and international community is witness to a series of campaigns of intoxication, discredit and defamation aimed at weakening the moral strength of the Church, particularly of His Eminence Cardinal Laurent Monsengwo, (Archbishop of Kinshasa), and to divert the attention of the population to real problems", says the statement. The Bishops are also worried about the vast areas of insecurity in different provinces: "in the Grand Kasai, in North and South Kivu, in Ituri, the presence of assailants who sow death and desolation makes one think of a set up plan of occupation and Balkanization", the Bishops write. "At this stage of the electoral process one has the right to ask: who benefits from destabilizing the Country?". Tensions have increased due to the lack of implementation of the Agreements of December 31, 2016, especially as regards to the freedom of press, the release of political prisons and the return home of opponents exiled abroad, and the controversy over the electoral voting machines provided by the Independent Electoral Commission (CENI). Opposition, civil society and some international partners of the DRC say that these devices, aimed at speeding up the voting operations and their counting, represent more a problem than a solution. CENCO reaffirms the urgency to vote in 2018 and calls for the full application of the New Year's Eve Agreement, allowing freedom of expression and demonstration, and the release of those arrested during previous demonstrations.